You might say this precious boy was hitchhiking. Fortunately, he was picked up by a caring person who is trying to find him a peaceful and loving home to match his personality. It is estimated that he is close to 10 years old. He is well mannered,even tempered and desperately looking for a forever home. Could that be you? "Please help me to place this sweet dog in a great home. I found him wandering alone, hungry and dehydrated. When I stopped to see if he had a tag, he climbed right into my front seat. He has had his current rabies shots,and kennel cough vaccination,he is neutered. He is small,beige white short haired older dog. about 30 lbs. In healthy condition, slight clouds in his eyes as all older dogs get,no fleas, ticks or worms. Vet gave him a checkup. Very friendly, seems house trained, gets along well with other dogs. 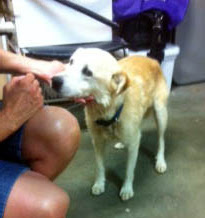 Walks on lease, He has been staying at a vet tech home as we are finding him a loving place, Nice for older people. not destructive. Would need to be walked or fenced in yard, as he will wander. Please network this boy far and wide from Facebook to Twitter. He needs a great home."